WASHINGTON (May 25, 2015) -- "I came up here to honor fallen Soldiers and kind of show my support for all the guys that are no longer here with us," Master Sgt. Edell Price said. Price was among the several thousand motorcyclists queued up at the Pentagon, May 24, to participate in the Rolling Thunder motorcycle ride around the National Mall in Washington, D.C. Now in its 28th year, the event, held on Memorial Day weekend, is meant to draw attention to Service members, who were taken prisoner of war, or who have gone missing in action. Staff Sgt. Nate Washington, Master Sgt. Edell Price, Edwina Price, and Cpl. 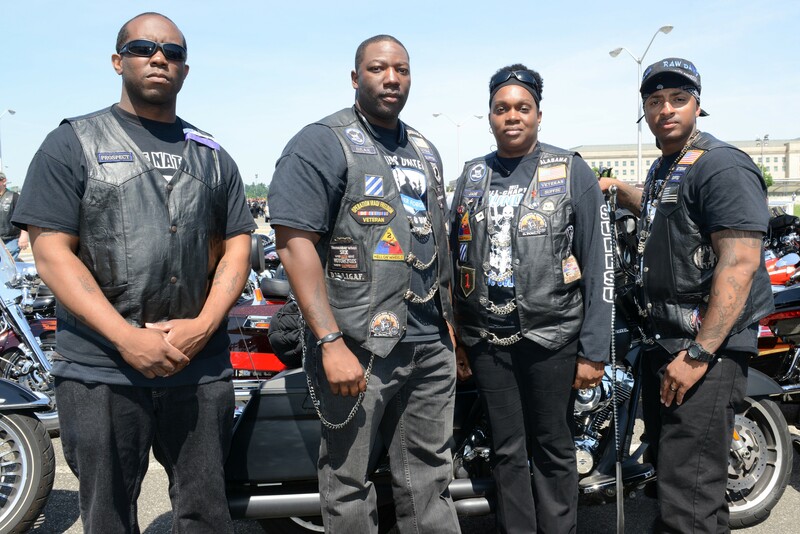 Buford Bracey, all from Fort Lee, Virginia, were among the several thousand motorcyclists queued up at the Pentagon, May 24, 2015, to participate in the Rolling Thunder motorcycle ride around the National Mall in Washington, D.C. Now in its 28th year, the event, held on Memorial Day weekend, is meant to draw attention to Service members, who were taken prisoner of war, or who have gone missing in action. Price is an active-duty Soldier, stationed on Fort Lee, Virginia, where he is a unit supply specialist with the 23rd Quartermaster Brigade. He has deployed three times to Iraq, as well as once to Saudi Arabia. At Fort Lee, Price also serves as a motorcycle safety instructor. "I train and mentor Soldiers on motorcycle safety," he said. "We work in conjunction with the installation safety office. We partner with them, and all the units on Fort Lee, and try to get all the riders to act responsibly." He said they do training about once a month, and that includes both in a classroom and training that involves actually being on a motorcycle, including skills-training on the installation safety course. Price rode up to Washington, D.C., along with about 31 other riders who are part of the "Soldiers United" motorcycle club. The group is mostly active, retired and veteran Soldiers. Among them was Cpl. Buford Bracey, who has served in the Army for nine years now. He is also a unit supply specialist on Fort Lee with the 832nd Ordnance Battalion. "I came up today to pay my respect for fallen Soldiers, either in combat or in garrison," Bracey said. Bracey said he has been riding since he was a young boy, when he started on dirt bikes. Today he rides a Harley Davidson Ultra Classic. He said he was impressed with the showing of support for veterans at the Rolling Thunder event. "Only word I can come up with is awesome," he said. "I can't believe this many people showed up to remember fallen, POW and MIA Soldiers. And I can't believe this many people have bikes. You don't really see that many. You can tell here that people have come from all over the United States to come here and remember." Bracey said he joined the Army in 2006 as a way to get some discipline in his life, and said that the decision to join was a good one. 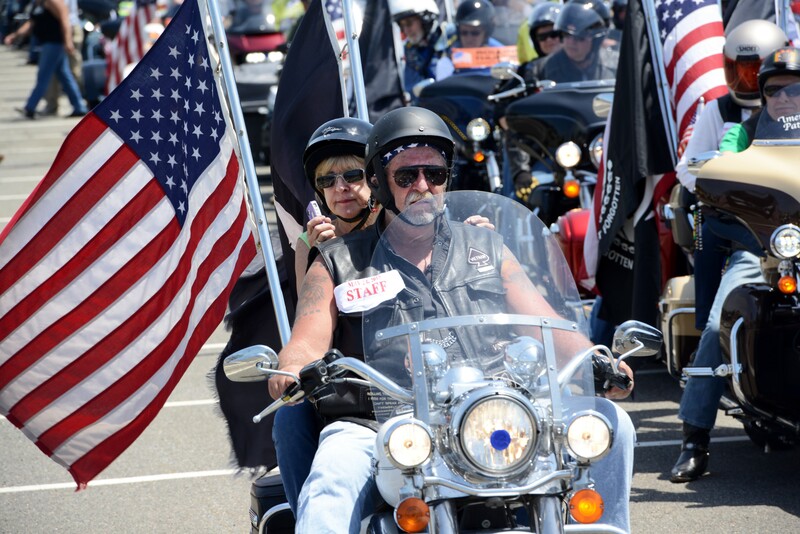 Several thousand motorcyclists queued up at the Pentagon, May 24, 2015, to participate in the Rolling Thunder motorcycle ride around the National Mall in Washington, D.C.
"I joined the Army to get a better jump start in life," he said. "I came up kind of hard, and needed a route that I could take. I needed to get more discipline in life. I chose the Army as a way to get more discipline in my life, and it has worked. I can't imagine what I would be doing now if I hadn't joined the Army." Staff Sgt. Nate Washington is a petroleum supply specialist, but serves now as an instructor at the Army Logistics University, Noncommissioned Officer Academy on Fort Lee. He has been in the Army since 1998. He said it is the first time he has participated in the Rolling Thunder ride. "I'm in awe of this. I've always wanted to do this. Now that I'm here, this is great," he said. Having been deployed to Iraq and Afghanistan three times each, he said he has known many Soldiers who have given everything for their country. "Too many," he said. "This is riding for the fallen, for my battle buddies. Memorial Day is riding for the fallen," he said. Like Bracey, Washington said he joined the Army for the discipline. "I was a young knucklehead. I was in the streets," he said. "Once I joined, I had a good drill sergeant who straightened me away - and that is what I wanted to do. That's why I stayed." Price said the Army has a good record of taking all kinds of people and putting them on the path to success. "One of the big things about the military is that it takes people from all walks of life and gives us a common goal," he said. "The Army is all about standards and discipline. Whether you came in as a knucklehead, or from a privileged background, we all have a common goal. That's really what being a Soldier is all about: coming together as a cohesive unit to accomplish a mission."